These are still my all time favourite facial moisturisers! I was given these in sample sachets and liked them so much I just had to buy them in full size. First up we have the L'Occitane Immortelle Precious Fluid. This day cream is wonderfully light and soaks in very well. I found this is perfect as a pre-makeup base, since it leaves no residue or greasiness. 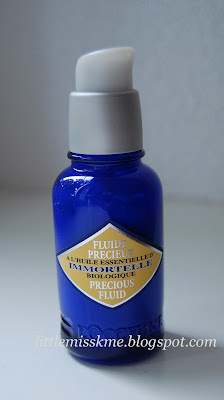 Precious Fluid is ideal for anyone out there with combination skin, as it won't clog your pores!! Next is L'Occitane Immortelle Precious Night Cream. Prior to trying the sample, I had NEVER used a night cream. The first morning after using this cream, I immediately noticed that my skin felt softer and smoother. The cream itself is very thick so you only need a small amount, making it well worth the money. Again this cream doesn't clog your pores so even someone with oily skin can use it. Good to hear that neither of these clog your pores. I might check them out.